Miss Justice - Expert Motoring Lawyer defending drivers nationwide: Watch Out For Wiggins! The whole team at GeoffreyMiller Solicitors have been avidly watching the Olympics for the last couple of weeks. We were really excited to see Bradley Wiggins win the cycling time trial especially after his victory in the Tour De France. 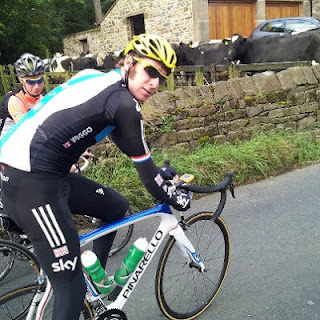 Wiggo, pictured here leading the sportive in Barnoldswick today, has said that he hopes that more people will take up cycling and we echo his thoughts! In anticipation of the country's roads filling with more cyclists than ever before, our team of specialist motoring lawyers decided to find out exactly what vehicle drivers have to look out for when they meet a cyclist on the road. The rules are slightly different depending on whether a cycle lane is marked with a solid or a broken white line. Where there is a solid white line you must not either drive or park in the cycle lane. If you do then you could be fined up to £1,000.00. Some cycle lanes are not always active. Outside the times of operation no restrictions apply. If a cycle lane has waiting restrictions then parking in it will land you with a fine. It can sometimes be quite frustrating to get stuck behind a bicycle when it is holding you up by going slowly in front of you. You should never be tempted to overtake unless it is completely safe to do so. If this means crawling along at 5mph or even stopping then that is what you have to do. The basic rule is that you need to leave just as much space for a bicycle as you would for a car. You should also stay behind if you are following a cyclist approaching a roundabout or junction, and you intend to turn left. If you do not stick to the rules you could be prosecuted for careless driving or even dangerous driving in extreme cases. The likelihood of being prosecuted is increased dramatically if there is an accident. Be careful when you open your car door. If you injure or endanger a cyclist (or anyone else for that matter) by doing so then could be committing an offence under the The Road Vehicles (Construction and Use) Regulations 1986 and you risk a fine of up to £1,000.00. It is also highly likely that you will be liable in a civil claim for any passenger's negligence in opening their door onto a cyclist so watch out for your passengers' actions as well as your own. This is the general advice given in the Highway Code. Not following it is not a criminal offence in itself. Like all advice in the Highway Code it is a good idea to follow it so that you stay safe and avoid civil liability as well as a claim on your insurance. Cyclists in front of me are riding three abreast and blocking the road. The cyclists are in the wrong. They should only ride two abreast on a normal road or in single file on a busy/narrow road. The fact that the cyclists are not obeying the rules of the road does not give you the right to do the same. You should drive behind the cyclists, keep a safe distance and wait until there is a safe place to overtake. There is a bike in front of me who is 2-3 metres into the road. If he moved over I could get past. Can I sound my horn to get him to mover over? No. Cyclists are entitled to ride away from the kerb to avoid potholes, debris and drains. You should not try to intimidate them. I am waiting at a red light. A cyclist has undertaken me coming up to the junction. Is there anything that I can do? It can be quite dangerous for bikes to pass on the nearside (passenger side). They are often in a motorist’s blind spot and can sometimes get crushed by trucks or buses. You should be particularly vigilant and always watch out for cyclists doing this. It is not advisable to take the law into your own hands. You could potentially report the matter to the police but it is very unlikely that they would take any action.